Click on the respective card to learn more. University of Pittsburgh "Music on the edge"
"Was war, kehrt nicht zurück"
You can find past concerts of the years 2007-2016 here. Trio SurPlus was founded in 1992 by members of the Ensemble SurPlus in Freiburg, Germany with the goal of interpreting new and unknown composers irrespective of style and intellectual or technical requirements. 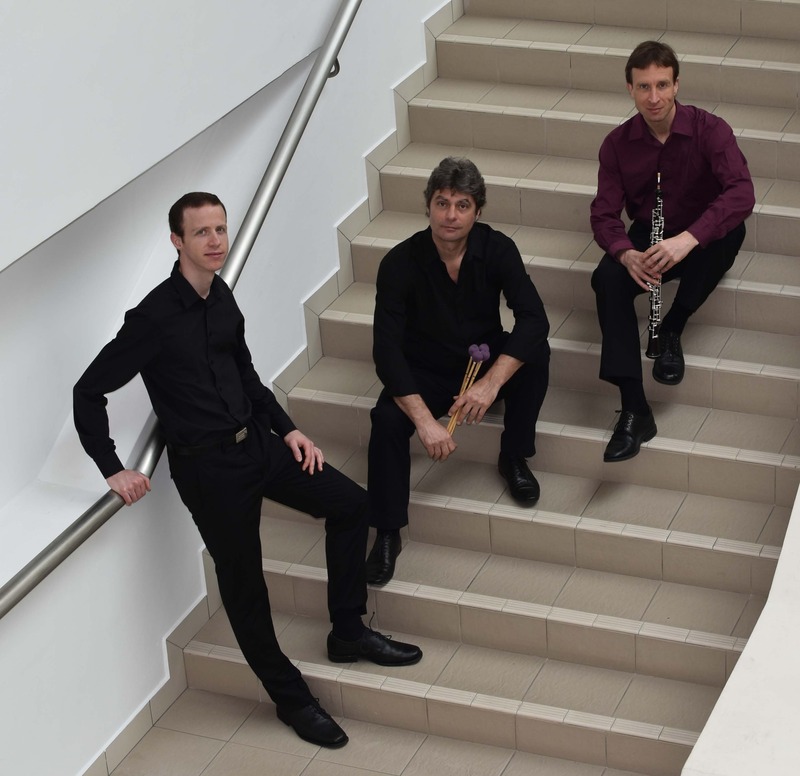 The Trio SurPlus has given numerous premieres and through its efforts created a repertoire for the unusual instrumentation of oboe, piano, and percussion. Concert series and masterclasses have brought the trio to other European countries as well as Canada, the USA and South-East-Asia. A CD of Trio SurPlus is available on Edition Zeitklang. 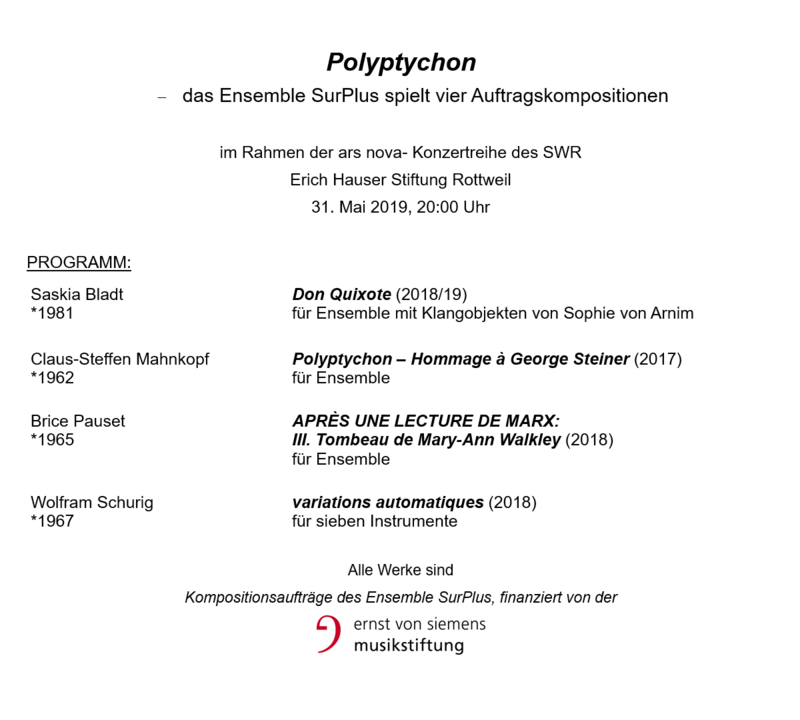 The musicians of Ensemble SurPlus, together with their audiences, the composers, and radio- and CD-listeners can look back on three seasons, in which Ensemble SurPlus has expanded its activities and broadened its horizons. Alongside their first guest appearances at Harvard-University, Boston, in Ecuador and Korea, long standing institutional cooperation and international commitments were maintained. 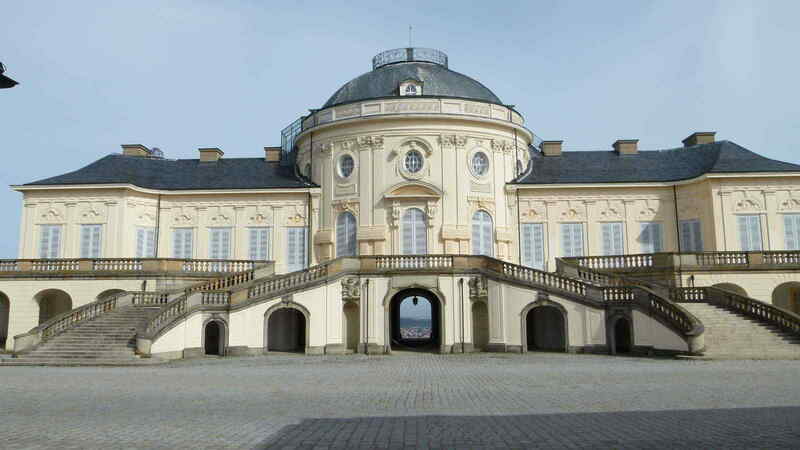 Not only renewed invitations to Buffalo/New York, the home of one of the leading festivals for new music in North America, but also the summer courses at the Academy “Schloss Solitude“ in Stuttgart, run by an internationally acclaimed group of composers were on the ensemble‘s programme. 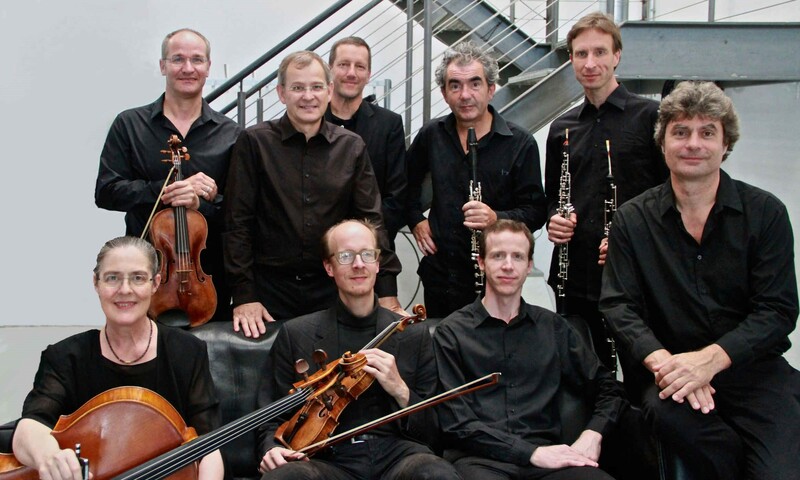 At the same time, activities in Freiburg, where the ensemble is based, have been undergoing continuous development. The pedagogically orientated projects such as workshops, lecture concerts, discussion concerts have been intensified, not only targeting the expert audience, but also a broad circle of recipients, for instance pupils at secondary school or young instrumentalists, participating in a competition. Live recordings of concert performances were broadcasted by “Südwestrundfunk“ and “Deutschlandradio Kultur“. 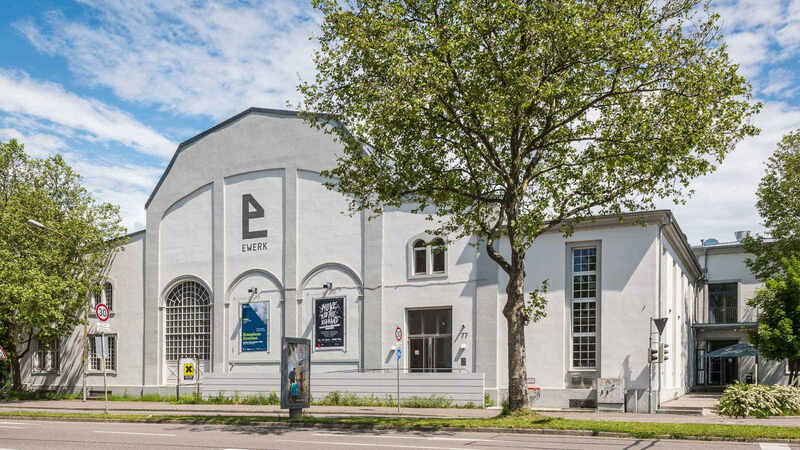 The Ensemble also gained support from regional institutions, such as the Cultural Office Freiburg and the Regional Council of Freiburg, from nationally orientated institutions like the National Culture Foundation, as well as special support for international activities by the Foreign Office (Goethe Institut). 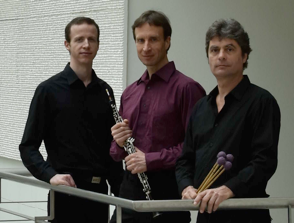 In 2010, the ensemble received an award from the Ernst-von-Siemens Music Foundation with the purpose of commissioning compositions for the ensemble - the works by Prof. Dieter Mack (Musikhochschule Lübeck) and Prof. Claus-Steffen Mahnkopf (Musikhochschule Leipzig) will be premiered 2012 at the anniversary concert in celebration of 20 years of Ensemble SurPlus in Freiburg, the compositions by Prof. Daniel Biró (Vancouver, Canada) will be premiered January 19th, 2013 in Toronto. 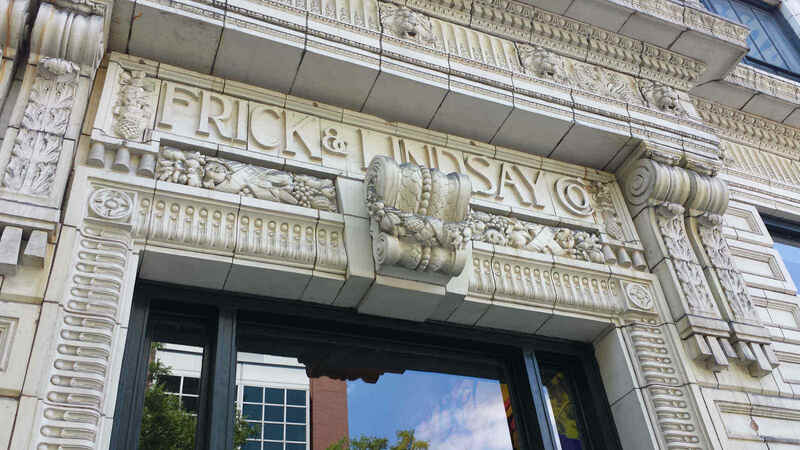 In the above mentioned activities, Ensemble SurPlus remained true to its ideals - particularly by choosing outstanding works and concepts, regardless of the possible difficulties. They thus not only overcame exceptional technical challenges but have also developed a fresh approach to their performance modalities - on one hand, performing under renowned guest conductors and on the other, rehearsing extremely ambitious compositions either completely without a conductor or with an ensemble member conducting. In addition to the actual rehearsing and performing, the musicians themselves have deepened their pedagogical, musicological and concert-didactical activities, and have hence contributed to the intensive cooperation with institutions and musicians in Freiburg and beyond. Suite fuer zwei Klaviere (1956) aus dem Ballett "Natures Mortes"
"le son d'un monde secret et couvert"
Works of Amy Williams, Eric Moe, Mathew Rosenblum, Bruno Mantovani a.o. Trio SurPlus continues his series of collaborations with German and international composition classes and presents in co-operation with Incontri, the institute for new music at the school of music in Hannover new works from the master and soloist classes from Ming Tsao and Gordon Williamson. In the works from Greek, South Korea, Finland and Israel students you can find a wide spectrum of compositional approaches between complexity and differentiated guided improvisation. 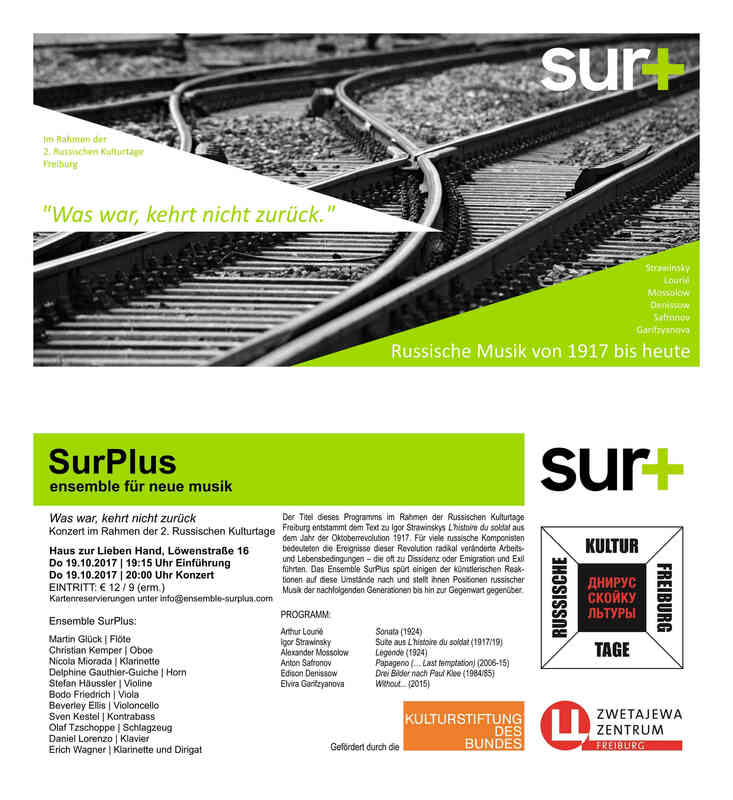 The program is rounded up by the latest written work for Trio SurPlus by also invited Bremen composer Jörg Birkenkötter. Impulse, Anstöße, Auslöser - seit 25 Jahren versteht das Ensemble SurPlus die Musik seiner Zeit als herausforderndes, weitertreibendes, sich ständig verwandelndes Gegenüber und hat sich ihr in überzeugter Offenheit verpflichtet. Doch auch der Rückblick auf Ausgangspunkte, Knotenpunkte und Verzweigungen im umfangreichen Repertoire fördert immer wieder Unentdecktes, Unabgeschlossenes und Anderszuhörendes zu Tage. Der anhaltenden Bewegtheit im Voraus- wie im Rückblick steht schließlich die Vielzahl erfüllter Momente zur Seite und gegenüber, in denen die Konzertbühne zu einem Ort intensiver musikalischer Gegenwart wird. Aus dieser dreifachen Perspektive stellt sich das im Jubiläumskonzert präsentierte Programm als ebenso rätsel- wie beziehungsvolle Konstellation von Werken dar, die zunächst wenig zu verbinden scheint, die sich aber umso stärker als Resonanzräume füreinander öffnen und zu individueller Spurensuche einladen. Dániel Péter Birós Komposition Mishpatim I ist mit ihrer Nähe zur Sprache, ihren alttestamentarischen Textfragmenten und ihrer zugleich nach Innen und auf Jenseitiges gerichteten Gedanken- und Klangwelt ein Ausgangspunkt besonderer Art. 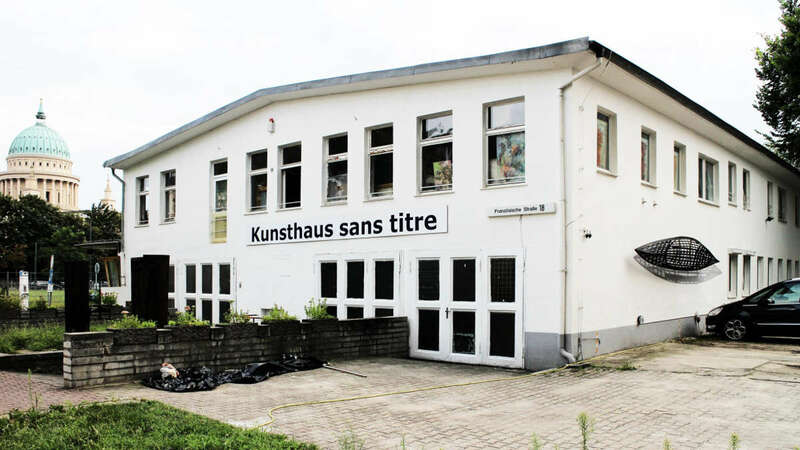 Der gesamte gleichnamige Zyklus von Biró wird überdies in diesem Jahr in einer Aufnahme des Ensemble SurPlus auf CD erscheinen. Gänzlich in instrumentale Musik verwandelt hat sich die literarische Keimzelle von Sidney Corbetts Gesängen der Unruhe, in denen Fernando Pessoas berühmtes Buch der Unruhe mit seinen irritierend kreisenden Fragmenten nachklingt. Ist Birós Werk ein Anfang, so führen die beiden Ensemblestücke Delos und Night von James Clarke eine Doppelexistenz als selbständige Kompositionen und als Schlusssätze seiner Kammersinfonie. Auch sie sind von existentiellen Unruhe erfüllt und verknüpfen in vieldeutiger Weise Erinnerungen an einen antiken Mythos mit einer Nachtmusik sehr unvertrauten Charakters. 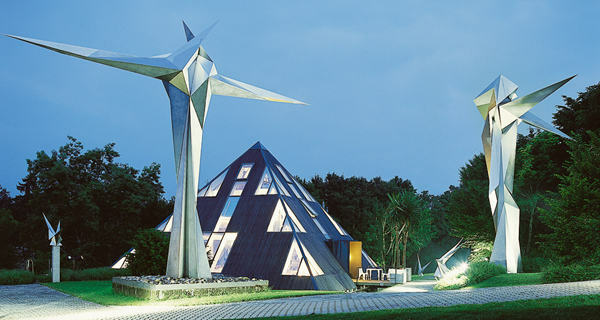 Entfaltet der Klang hier suggestive Wirkungen, so präsentiert er sich in Bruno Mantovanis Concerto de chambre No.2 in elastisch-energetischen Verläufen, die ein vitales Zentrum des Abends bilden. Ergänzt wird das Programm durch eine Triokomposition, die jüngst für das Ensemble geschrieben wurde und für ein weiteres, in die Zukunft gerichtetes und offenes Ende des künstlerischen Spektrums steht. Das Ensemble SurPlus präsentiert mit Panzerkreuzer Potemkin Sergei Eisensteins epochemachenden Stummfilm mit einer aktuellen Musik des Freiburger Komponisten Cornelius Schwehr. 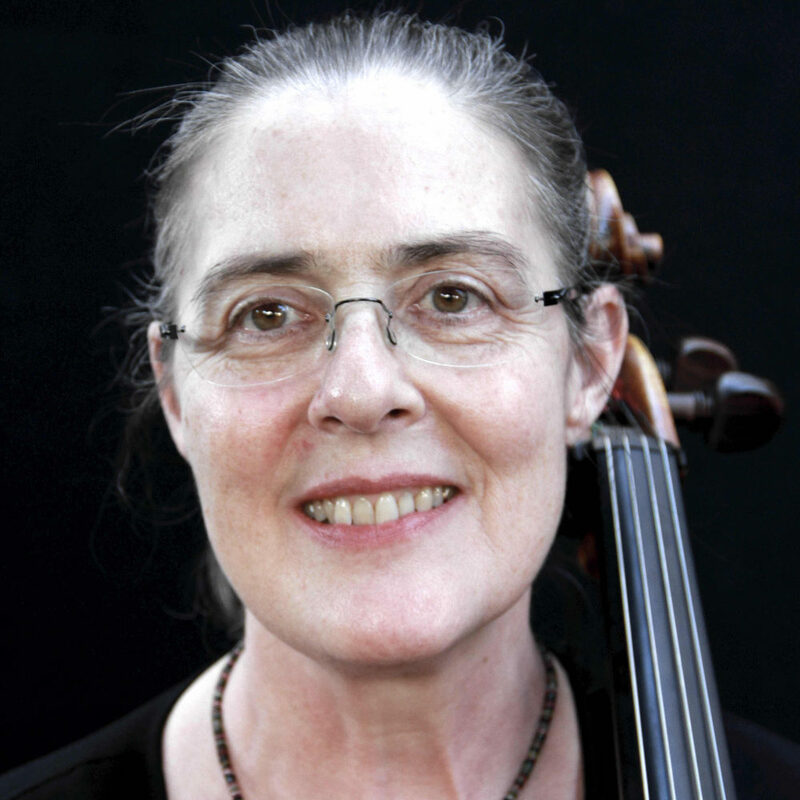 The cellist Beverley Ellis was born in Scotland and grew up in Australia. She studied music at the University of Adelaide, then with William Pleeth in London and finally at the Musikhochschule in Freiburg, where she graduated with the Soloist’s Diploma in 1987. From 1990 to 1994 she was principal cellist in the Kurpfälzisches Kammerorchester in Mannheim, with which she regularly appeared as soloist (concertos by Haydn, Boccherini and Stamitz). She lives in Freiburg, teaching and playing, both as a soloist (Tchaikovsky, Shostakovich, Elgar) and in various chamber groups, covering works from early music (on Baroque cello) with the Kammerorchester Basel, up to music of the present day. She has been a member of Ensemble SurPlus since 1995 and has played as guest artist in other ensembles for new music, including Aventure and musikFabrik. She has participated in numerous radio and CD recordings and appears regularly in concerts and festivals internationally. Born in 1965 in Trier. Without beginning first with the violin, he was immediately drawn to the viola and had lessons on that instrument with Rudolf Reiet in Trier and Eckart Schloifer in Saarbrücken. During that time he received a prize from the German State of Rheinland-Pfalz. 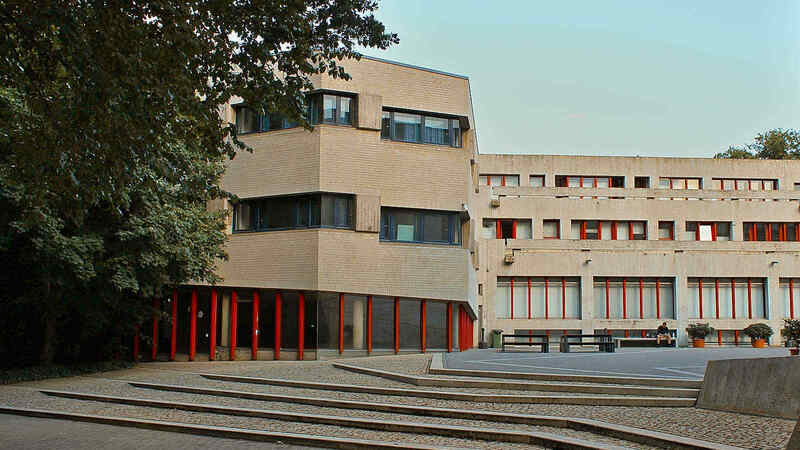 He continued his studies with Ulrich Koch at the Musikhochschule in Freiburg and later with Madeleine Prager at the Musikhochschule in Karlsruhe. At the same time he visited the Foundation Villa Musica where he performed with Martin Ostertag, Yuri Bashmet and Irena Grafenauer. Further stipends brought him to Walter Levin at the Mozarteum in Salzburg, the Emerson Quartet and Lynn Harrell at the Los Angeles Philharmonic Institute and to other orchestras in which he played under Simon Rattle and David Zinman. After his studies in Freiburg and Karlsruhe Bodo Friedrich was assistant solo violist in the Philharmonisches Orchester in Freiburg until he decided to devote his time to the string quartet (first the Ophelia Quartet and then the Artemis Quartet). 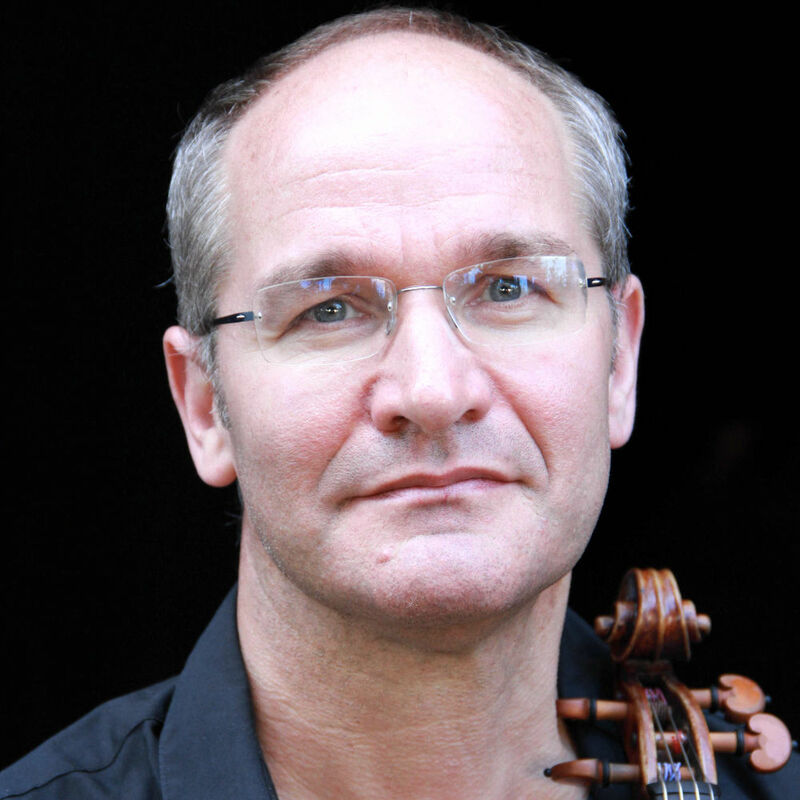 Since 1998 Bodo Friedrich is solo violist in the Kammerorchster Basel, since 1997 in the Bayerische Kammerphilharmonie in Augsburg and is often a welcome guest as solo violist in the Kölner Kammerorchester. He is a founding member of Ensemble SurPlus. Christian Kemper was born in Düsseldorf in 1969. 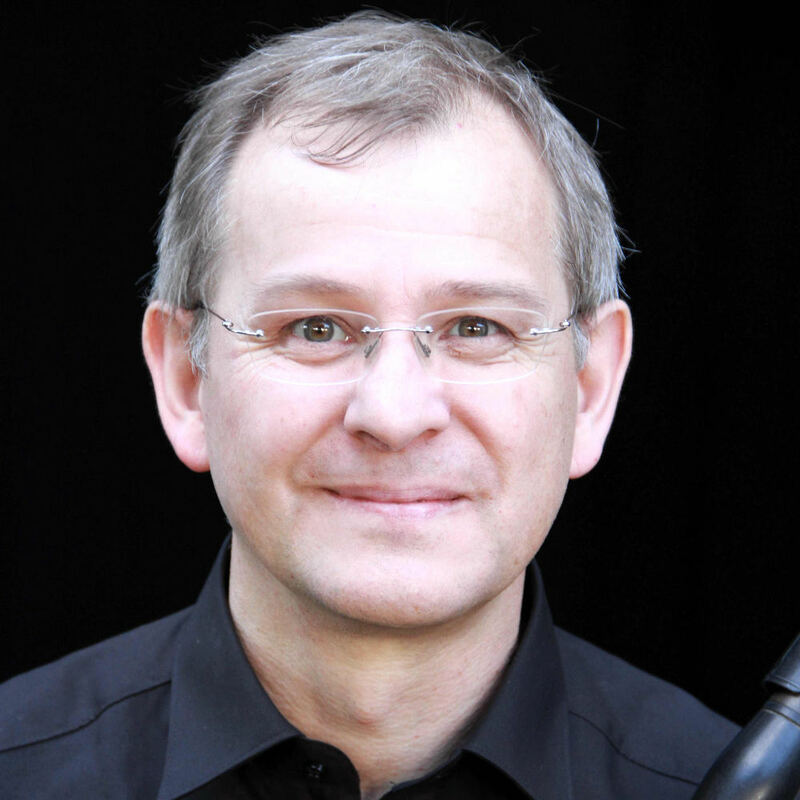 He studied oboe with Martin Schie at the Folkwang-University Essen/Duisburg, with Thomas Indemühle at the University of Music in Karlsruhe and he took lessons with Peter Veale during the International Summer Courses in Darmstadt. He also completed studies in music theory with Bernd Asmus in Karlsruhe. He is a member of the Initiative für Neue Musik SUONO MOBILE (Stuttgart) as well as of the Freiburg-based ensembles SurPlus and Chronophonie. 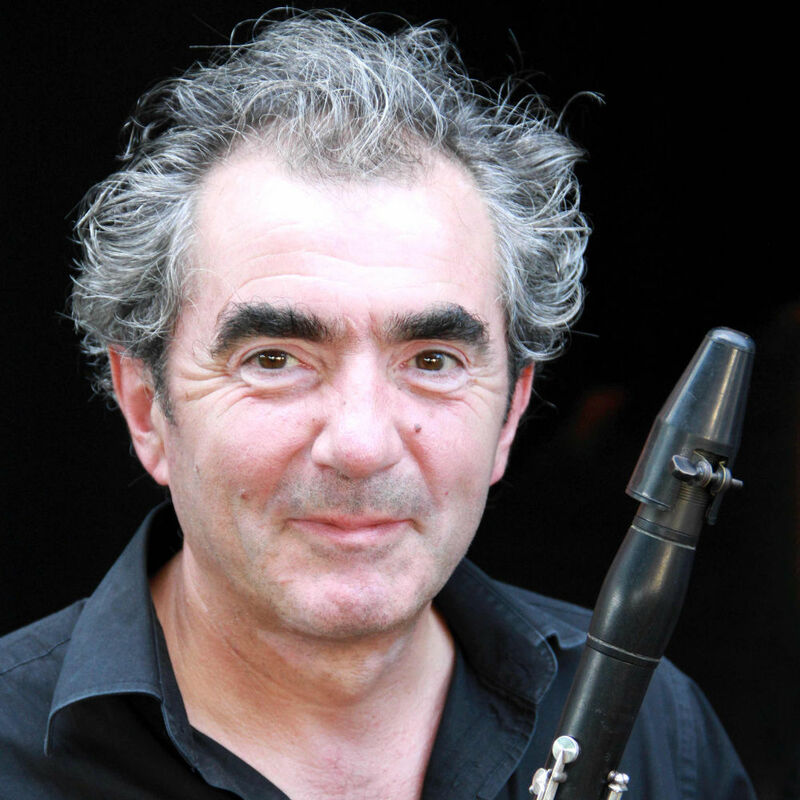 Moreover he is co-founder of the ensemble Chambre d'écoute, which combines contemporary chamber music with music from different periods and experimental concepts. 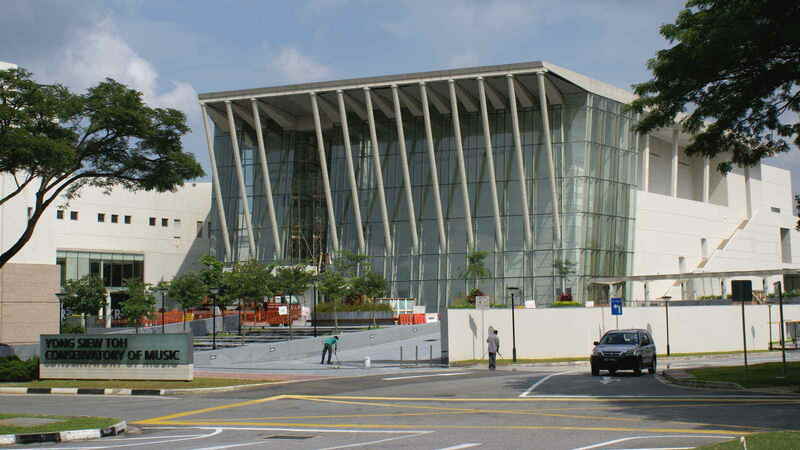 As a performer and lecturer he travelled in numerous European countries, in the United States, South America and Asia. 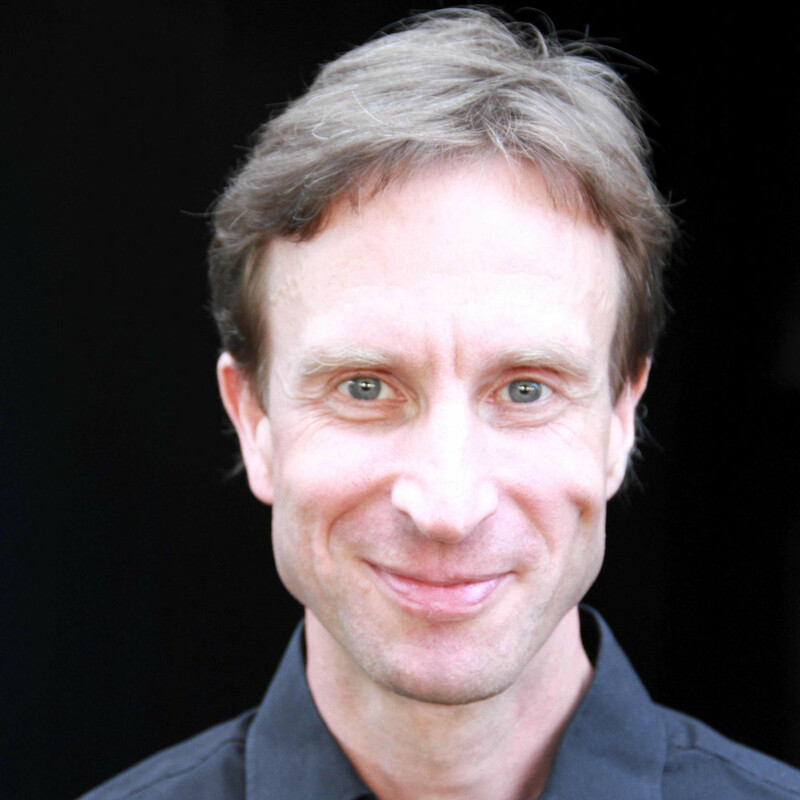 He taught music theory at the Universities of Music in Freiburg and Stuttgart and is currently a lecturer at the University of Music in Karsruhe. Erich Wagner was born in Todtnau, Germany. Musical studies with Dieter Klöcker at the Musikhochschule in Freiburg and with Hans Pfeifer at the Musikhochschule in Mannheim. Solo bass clarinetist in the Anhaltische Philharmonie in Dessau since 1993. As founding member of Ensemble SurPlus and with Ensemble United Berlin and Trio e-vent he has concertized extensively throughout Europe, Indonesia, Russia and America. He has made numerous recordings for radio and commercial labels, and has given master classes and concerts at the Conservatories of Music in Shanghai and Shenyang. Furthermore, he studied 20th century music at the Sorbonne University in Paris, where he obtained his doctorate on Basque composer Luis de Pablo with highest honours (‘très honorable avec félicitations du jury’) in 2013. 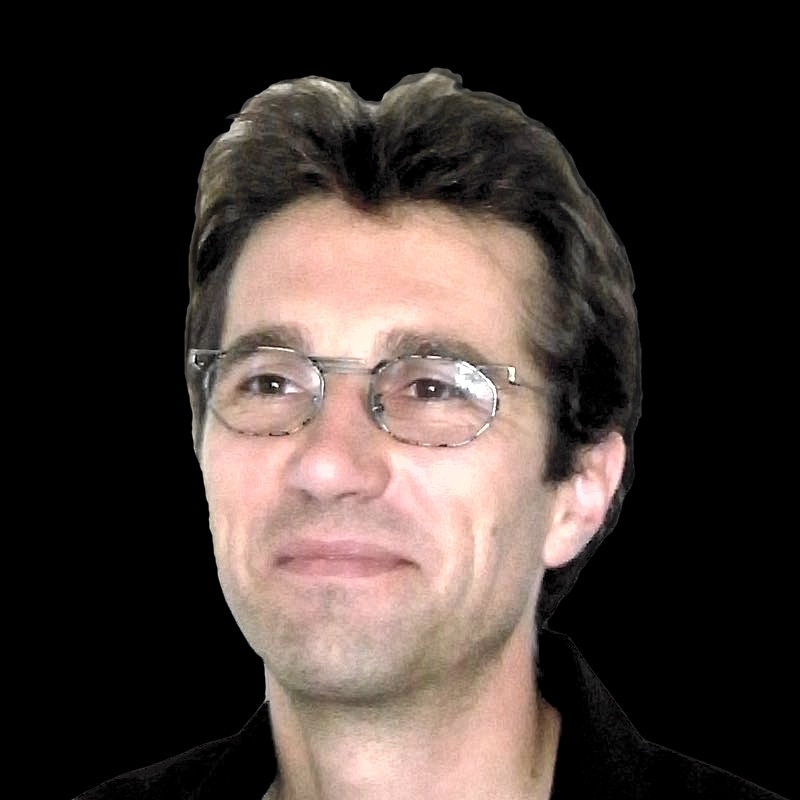 Daniel Lorenzo’s discography includes recordings with Peters/Naxos, Ensemble Modern Media and Capriccio/Delta Music. 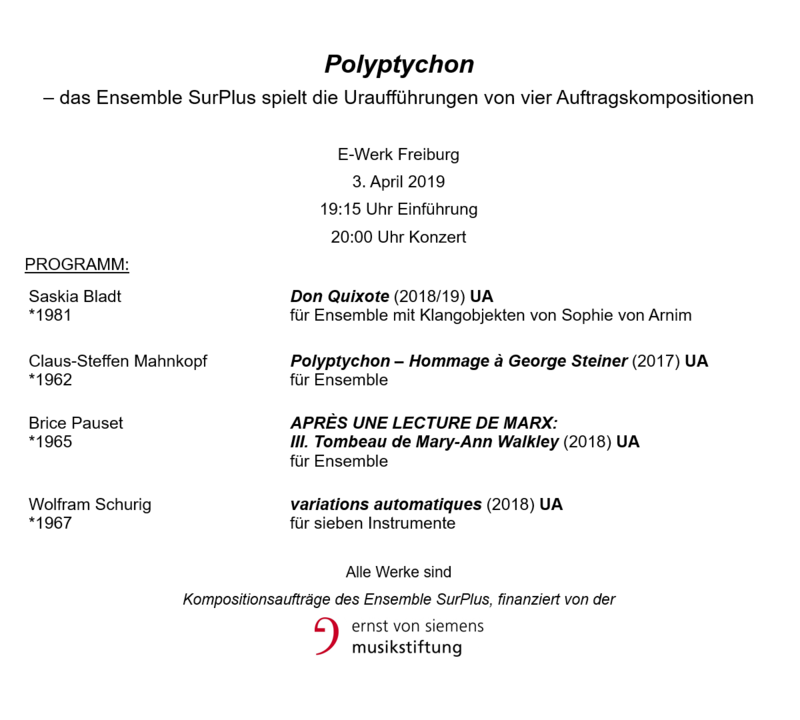 He is a founding member of the contemporary music ensemble MAM.manufaktur für aktuelle musik, a member of Trio SurPlus and a guest musician in the Ensemble Modern and in Ensemble Linea (Strasbourg). Born in Breno, Italy. Studies in clarinet at the Conservatory of Music in Brescia and with Dieter Kloecker at the Musikhochschule in Freiburg. Various prizes in international competitions. Concert activity as a soloist and in chamber music throughout Europe and the United States. Numerous recordings for radio and commercial labels. Member of Ensemble SurPlus since 1993. 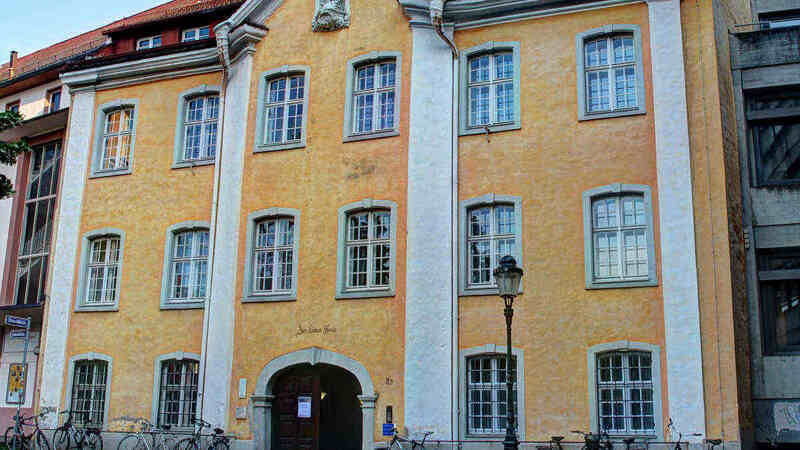 Musical studies at the Hochschule für Musik, Freiburg, and at the University of Michigan, USA. Founding member of Ensemble SurPlus. Since 1992 Member of Les Percussions de Strasbourg. Professor of percussion at the Hochschule für Künste, Bremen. Frequent concert activities as soloist and in chamber music ensembles. Guest appearances with the musikFabrik and the Klangforum. Pascal Pons was born in 1968 in Nice. He studied at the Conservatoire National de Région in Nice with Rodolphe Palumbo and in Versailles with Sylvio Gualda. He completed his studies(Soloist’s Diploma) with Bernhard Wulff at the Musikhochschule in Freiburg. His concert activity as a soloist has taken him throughout Europe and other countries such as Mongolia, the Ukraine, Argentina, Uruguay and Taiwan. Pascal Pons is a member of Ensemble SurPlus and performs regularly with Ensemble Modern, Klangforum, musikFabrik and the Kammerensemble für Neue Musik in Berlin. 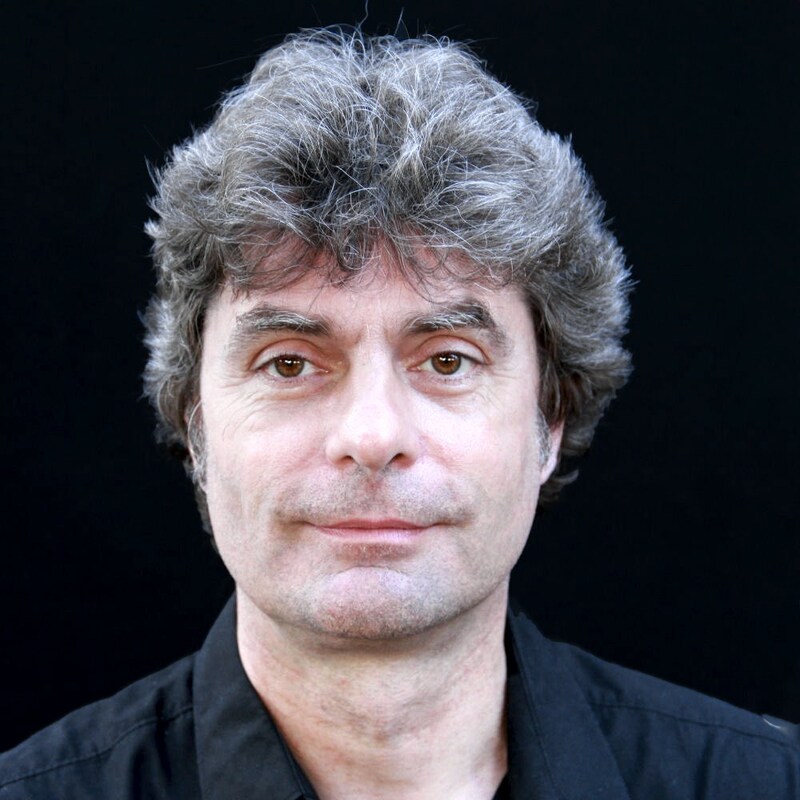 He has been professor of percussion at the Conservatoire des hautes études musicales in Neuchâtel/La Chaux-de-Fonds (Switzerland) since 2005, and since 1996 instructor of marimba and vibraphone at the Musikhochschule in Freiburg. 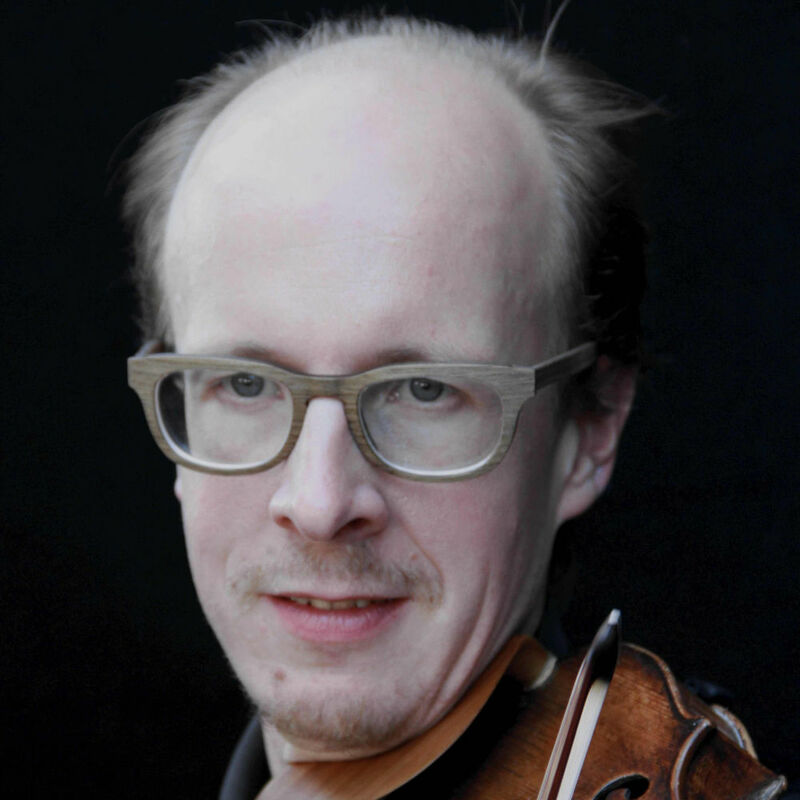 Already during his violin studies at the Musikhochschulen in Stuttgart, Basel and Berlin, Stefan Häussler concentrated on contemporary ensemble music. As a soloist he has performed the violin concertos by Schönberg and Berg, composers of the New Vienna School, and participated in numerous premiere performances and radio recordings of works for various instrumental combinations. In addition, Stefan Häussler studied musicology, philosophy and art history at the Universities of Basel and Freiburg. 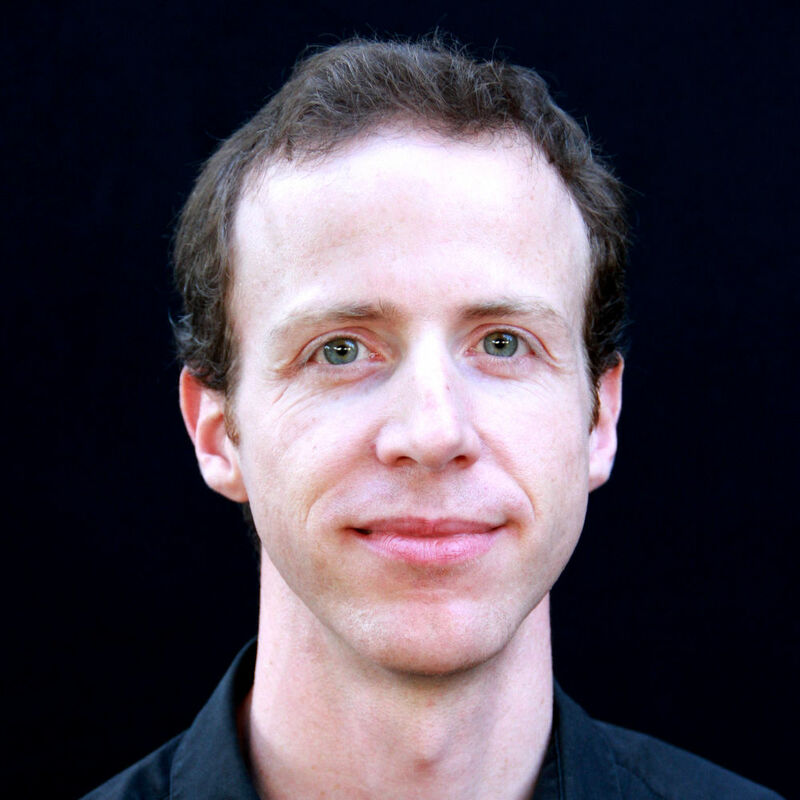 Aside from his concert activity he instructs violin pedagogy at the Musikhochschule in Basel, and is a teaching fellow in musicology at the University of Basel. Sven Kestel was born in 1966 in Stuttgart. He studied double bass with Thomas Stabenow, visited the Swiss Jazz School in Bern and continued his double bass studies with Wolfgang Stert at the Musikhochschule in Freiburg. 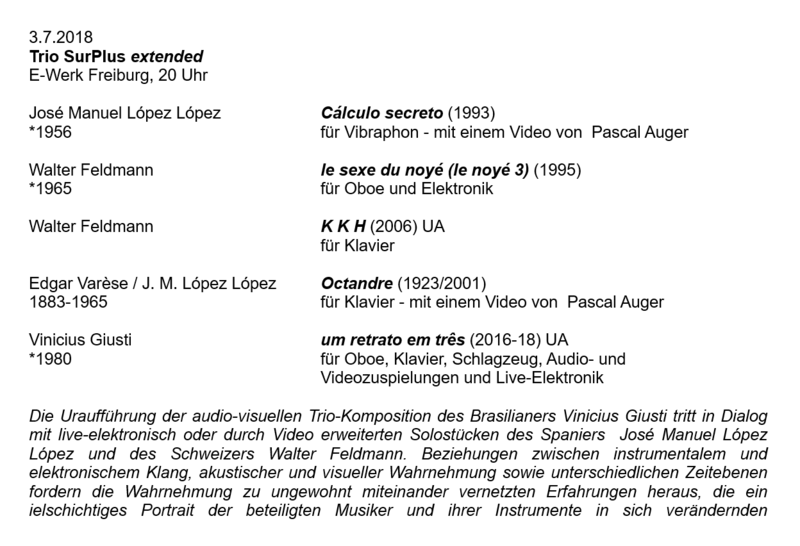 He has attended master classes given by Ludwig Streicher (Vienna), Klaus Stoll (Berlin) and Michinori Bunya (Würzburg). He is a founding member of Ensemble SurPlus. Guest appearances in Switzerland, Luxemburg, the Ukraine, Austria, Russia, Greece, Italy, Indonesia and America. Since 1996 a member of the Tangoensemble Guardia Vieja. From 1997 to 1998 bassist in the Philharmonisches Orchester in Freiburg. In southwestern Germany as jazz bassist with The Loungecore Poets and as freelancer in other small and big bands. 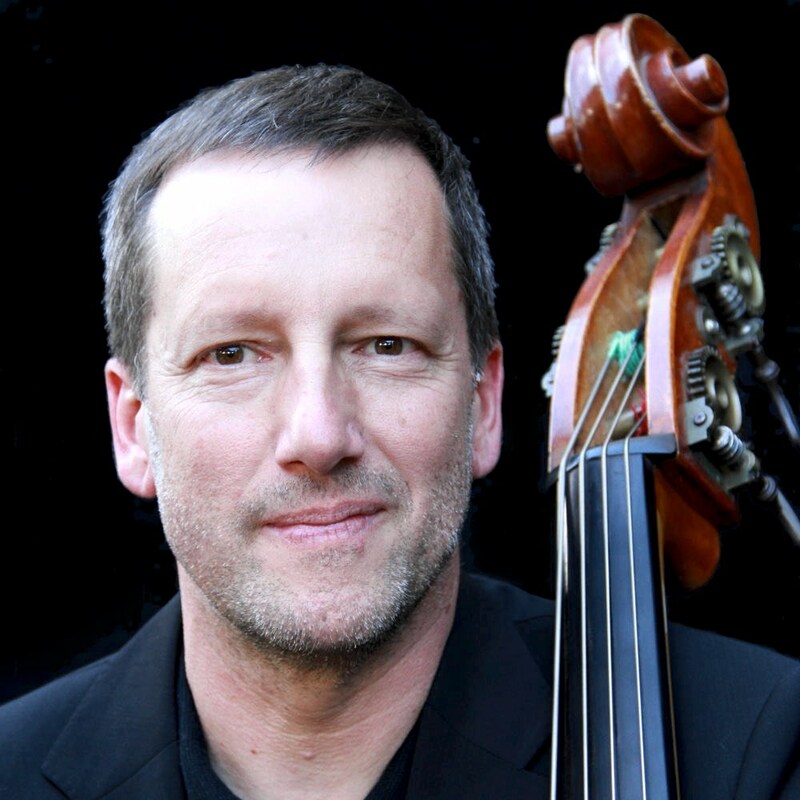 From 1998 to 2000 he was part of the orchestra for the musical Die Schöne und das Biest in Stuttgart, and since 1999 solo bassist in the basel sinfonietta. In 2001 he founded the concert agency SAM-Kulturmanegement.